Culturable bacterial diversity of seven marine sediment samples of Kongsfjorden and a sediment and a soil sample from Ny-Ålesund, Svalbard, Arctic was studied. The bacterial abundance in the marine sediments of Kongsfjorden varied marginally (0.5 × 103–1.3 × 104 cfu/g sediment) and the bacterial number in the two samples collected from the shore of Ny-Ålesund also was very similar (0.6 × 104 and 3.4 × 104, respectively). 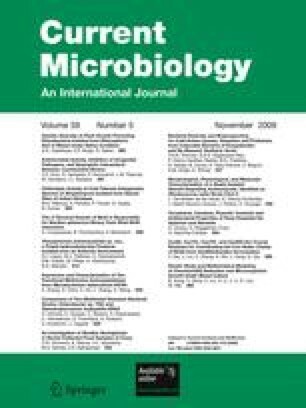 From the nine samples a total of 103 bacterial isolates were obtained and these isolates could be grouped in to 47 phylotypes based on the 16S rRNA gene sequence belonging to 4 phyla namely Actinobacteria, Bacilli, Bacteroidetes and Proteobacteria. Representatives of the 47 phylotypes varied in their growth temperature range (4–37°C), in their tolerance to NaCl (0.3–2 M NaCl) and growth pH range (2–11). Representatives of 26 phylotypes exhibited amylase and lipase activity either at 5 or 20°C or at both the temperatures. A few of the representatives exhibited amylase and/or lipase activity only at 5°C. None of the phylotypes exhibited protease activity. Most of the phylotypes (38) were pigmented. Fatty acid profile studies indicated that short chain fatty acids, unsaturated fatty acids, branched fatty acids, the cyclic and the cis fatty acids are predominant in the psychrophilic bacteria. The online version of this article (doi: 10.1007/s00284-009-9473-0) contains supplementary material, which is available to authorized users. We would like to thank the Department of Biotechnology and Council of Scientific and Industrial Research, Government of India for financial support to SS. SS would also like to thank NCAOR and Ministry of Earth Sciences, Government of India, for providing the financial and logistic support for the trip to Arctic.